Under normal circumstances, the single stage Vacuum Oil filter plant is extremely effective. However in exceptional cases where a higher state of vacuum is required to maintain low value of dissolved gases and moisture, we offer a double or three stage vacuum oil filter machine to solve this matter. Added advantage of this system include the facility of improving quality of filtered oil to a higher level under single pass at a temperature of about 60 degree. (i). UK G technology by which the trace water that is show chain, such as dissolved water, can be removed effectively. (m). Can be operated both on-load and off-load. (n). Can be operated fully-automatically with PLC controller. (o). 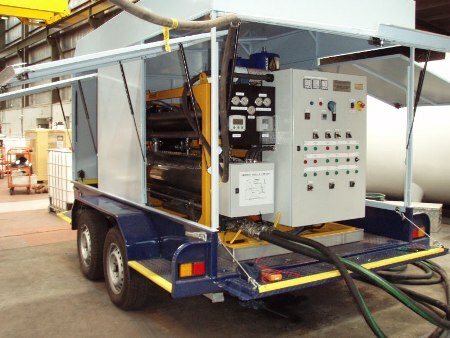 This Oil Filter Machine can be made in mobile, hermetical, canopy-covering, open and frame styles. Ionic Reaction Coloumn: In certain cases where there is need for decrease in acid content of transforer oil, an ionic reaction coloumn is provided complete with first file up of high grade neutralizing chemicals, an SS wire mesh for supporting media.